The HP Envy 110 e-All-in-One is a beautiful machine, with a small design - perfect for home use where space is limited. 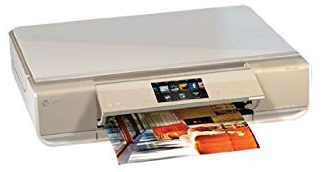 The multifunction inkjet printer can scan and print, it also has the usual "e-print" feature of the e-series, allowing you to send documents to your printer from anywhere in the world, by e-mail or your smartphone. The Envy 110 e-All-in-One is one of the most stylish designs in the HP e-All-in-One series. It measures only 101 mm wide, while the control flap and the paper support fold out automatically. are limited for storage space. The HP Envy 110 e-All-in-One also offers support for memory and USB cards, as well as WiFi connectivity. At the front, there is also a 8.7 cm LCD screen. In addition to the attractive and stylish design of the printer, the HP Envy 110 e-All-in-One also prints beautiful photos and documents. Another great feature is its rugged design, for such a small equipment it is very rugged - something that can be a relief for home users. Ease of use is also an asset with HP Smart Configuration Software.